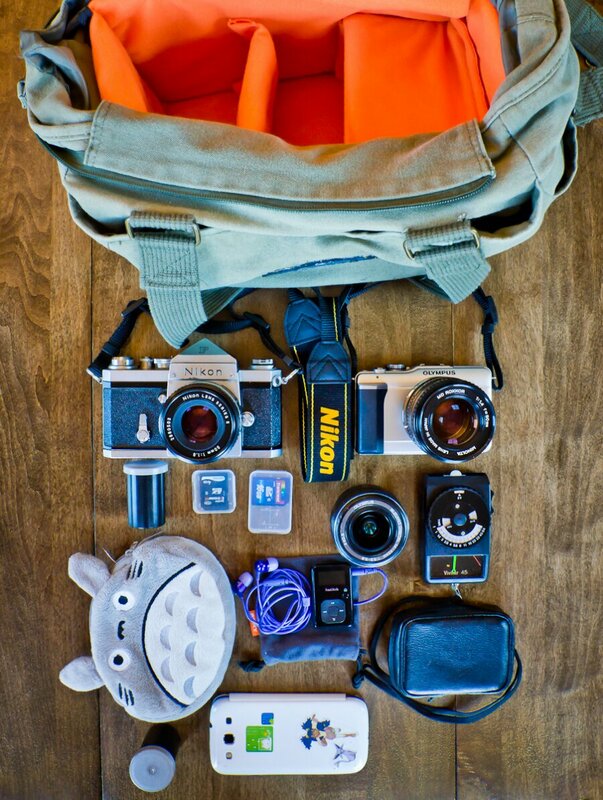 This is my semi-analog camera bag. I’ve got two cameras in here, my Nikon F and the Olympus E-PL1, in B&W mode. The Nikon has a 50mm lens attached and the Olympus has a 50mm Minolta MF lens and I also have the 14-42mm kit lens in the bag. Other gear includes a Vivitar 45 light meter, a couple rolls of film, and an SD card reader which can connect directly to my cellphone for remote uploading. I also have my Totoro bag in which I keep a couple spare SD cards and my Sansa MP3 player. The bag itself is an Aosta canvas bag that I bought at Yodobashi Umeda several years back. I replaced the insides with some bright orange padding, while the original, larger padding is being used in my messenger bag. The Totoro bag moves between this bag and my dSLR bag. So, in the morning, I can easily choose what I want to take with me. I don’t usually shoot too much film (just for convenience sake) but it is kind of fun to anticipate what the developed photos will look like. In fact, I’m not sure how old the film is in my other cameras, my Olympus XA, Minolta X-700 and Minolta a507si.